I have an embarrassing secret: Until a few years ago, my mom did my taxes. That’s right. An adult woman with a real job and several side gigs relied on her mother to do her taxes every year. One spring, I knew it was time for me to cut the cord and learn just how complicated this income tax stuff really was. I’ve been doing my own taxes ever since. Figuring out which tax preparer is right for you can be complicated. Do you stay at home and file your taxes with the help of software or venture out to visit a real-life accountant? And what about all those storefront tax-preparation services? We’re here to break down all your tax-preparation options so you can make the right choice this tax season. After reading this, maybe you too can stop asking your mom to file your taxes for you. You’re probably familiar with the idea of completing your taxes online or with software. The biggest perk of using a website or software is they don’t cost much. In fact, many allow you to file your federal tax return for free. These tax-preparation websites and programs make taxes easy because they walk you through each step of the process, asking you questions to determine which credits you might qualify for or what deductions you should include. All you have to do is plug in some numbers, and voila! Your taxes are done. Of course, you’ll have to pay more if you want bells and whistles, such as audit protection or extra guidance on rental properties. TurboTax, for example, ranges from $0 to $114.99 depending on the level of service you want. Those prices are for federal returns only — you’ll have to pay more to file your state returns. “These online options combine the benefit of doing your taxes from the comfort of home with the step-by-step guidance you might get from a traditional accountant,” said Aaron Lesher of Hurdlr. Of course, you won’t necessarily be working with an expert tax preparer if you go this route, which means you’ll miss out on their years of experience and tax knowledge. Some services do offer expert help via web chat or a phone help line, if you’re willing to pay for an upgraded version. If your financial situation is super-complicated, you may be able to navigate your taxes using a website or software. But if you’re concerned about accuracy, visiting with a tax expert in person might give you more peace of mind. Storefront tax-preparation services have popped up all over the country — you can even get your taxes prepared on your next trip to Walmart. Consider storefront tax preparers the next level up from using a software or a website — you’ll pay more, but you’ll also work with a live human. The folks doing your taxes at these storefronts have varying levels of experience and credentials. Some are enrolled agents, meaning they’re recognized as tax experts by the IRS and the U.S. Department of the Treasury. Others undergo company training. H&R Block, for example, requires its employees to take a 60-hour income tax training course. For people who already have experience doing taxes, the company requires them to take and pass an exam. The company keeps its tax preparers up to date on the most current tax rules with over 250 continuing-education courses. “A typical client is served by an H&R Block tax professional with more than a decade of experience and hundreds of hours of training,” according to the company’s website. Fees will vary with the complexity of your financial situation, but the average fee H&R Block charged last year was around $220, according to spokesman Gene King. Jackson Hewitt’s fees start at $48, but the average cost is about $230, according to chief tax officer Mark Steber. Don’t forget — the IRS lets you deduct tax preparation fees, and many of these companies offer promotions to get you in the door. Jackson Hewitt, for example, will give you $100 when you ditch your old tax preparer and work with its tax experts instead. These storefront tax preparers typically offer convenient evening and weekend hours, so it’s easy for you to drop by. Though you might only think of these national chains at tax season, many are open year-round for offer tax advice, just like an accountant or a private tax expert. Plus, many storefront locations offer tax-preparation guarantees, meaning if they weren’t 100% accurate, they’ll pay your penalties and interest. “We also guarantee that you’ll get the maximum refund you deserve, or we’ll refund your tax preparation fees,” said Steber. Not all accountants prepare taxes. And not all private tax preparers are accountants — some are attorneys and enrolled agents. But for the purposes of this post, we’ve lumped those folks together in one category. They’re also likely the most expensive option available (though not always). As with storefront providers, the fees these accountants and private enrolled agents charge depend on the complexity of your tax situation. More tax forms means work for them, which translates to higher fees. You could be paying anywhere from $176 to $457, according to national averages calculated by the National Society of Accountants. Those numbers also fluctuate by location. Keep in mind that some accountants and tax preparers won’t charge you a dime for an initial consultation — you’ll only pay if you decide to use their services. You also could get charged extra for disorganized or incomplete files ($117 on average! ), so make sure you keep good records and bring all of the relevant documents with you to your appointment. You may also want to seek out a private tax preparer if you have a specific financial situation or work in an industry they specialize in. I know an enrolled agent, for example, who used to be a police officer and now specializes in tax questions related to law enforcement. Other firms specialize in tax questions from freelancers or artists. Ryan Frailich, a financial coach and planner for Deliberate Finances LLC, suggests visiting an accountant if you have moved beyond the easy-to-understand tax stuff, are a small business owner or are planning to have a child soon. Since everyone’s tax situation is different, it’s hard to provide one-size-fits-all advice on how to get your taxes done. 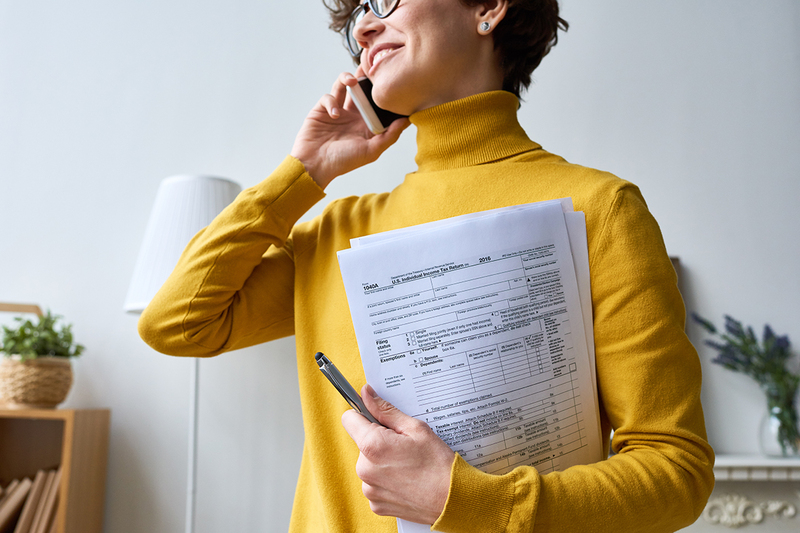 Generally speaking, the trickier your taxes are, the more help you’ll want doing them, but even that’s not true for everyone. You’ll want to weigh a number of factors against one another when determining whether to file online, use a software program, visit a national chain or work with a private preparer. What is your time worth? Sure, you can save a buck by doing your own taxes, but could you use that time for more profitable endeavors? Will you miss loopholes and tax credits that someone else might know about? Are you an introvert who hates leaving the house and cringes at the thought of sharing financial information with someone else? Either way, keep in mind that the folks selling all of these options are trying to earn your business. Treat offers that sound too good to be true with a healthy dose of skepticism, and make sure you look out for your own tax needs first and foremost. Sarah Kuta is a writer with a penchant for weekend thrifting, furniture refurbishment and good deals. Find her on Twitter: @sarahkuta.